1. K-608G: HVLP spray gun with 600 c.c. nylon cup. Forged anodized aluminium gun body, gravity feed. 2. 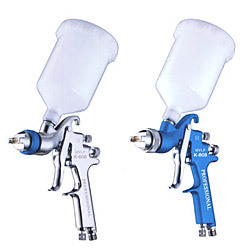 K-608S: HVLP spray gun with 1000c.c. aluminium cup. Forged anodized aluminium gun body, suction feed. 3. Nozzle size(mm): 1.3, 1.4, 1.5, 1.7, 2.0, 2.5, 3.0, 3.5.